It’s that time of year again! The much anticipated Atlanta Homes & Lifestyles Home for the Holidays opened its doors on November 19, and is open through December 7th. I was able to see the house on Monday, and it is full of beauty and inspiration. Here are some highlights of the spaces, although this barely scratches the surface – you will have to visit yourself to see all of the magnificent rooms! 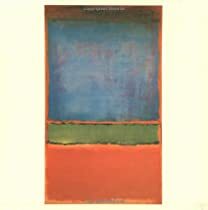 I visited the house at night, and because of the rich colors used in the interiors, and the soft lighting, good photos were very difficult. In fact, most of my pictures did not turn out well at all. I ended up switching from my nice camera to my iphone, which seemed to do a bit better. 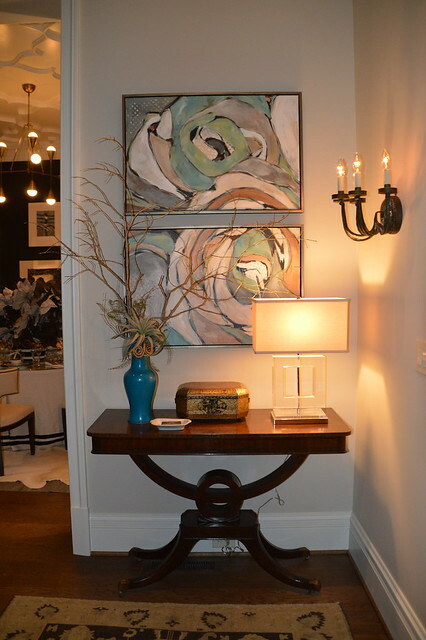 The bottom line is that the pictures do not do justice to the décor, so please visit to appreciate the design in person! 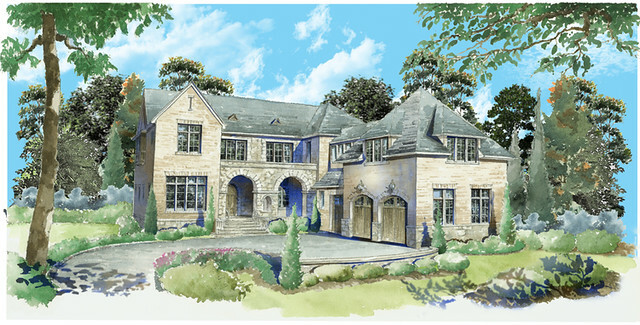 Harrison Design Associates were the architects of the house, which is described as a 7,200 square foot, English style home. It is actually on a lot that I looked at when I first started thinking about building a house back in 2009, so it was wonderful to see how this house was designed and sited to fit onto the lot, which hilly (as is very typical in Atlanta). 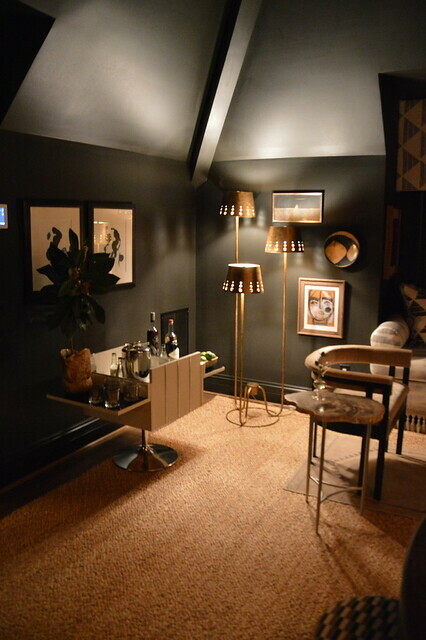 A vignette from the entry, which was designed by Liz Williams Interiors. 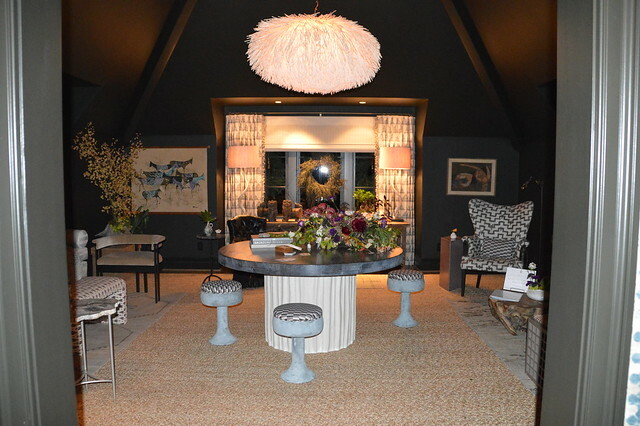 I always enjoy seeing Liz Williams’ designs, and the entry was one of my favorite spaces in the house. 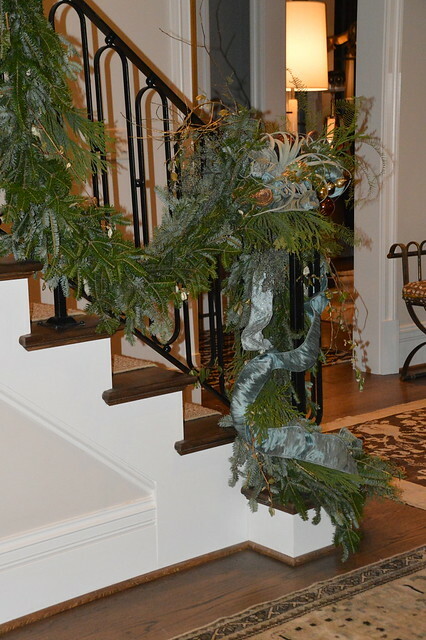 A bit washed out from my flash, but this gives a sense for the design of the stair garland, which is such a nice touch during the holidays. 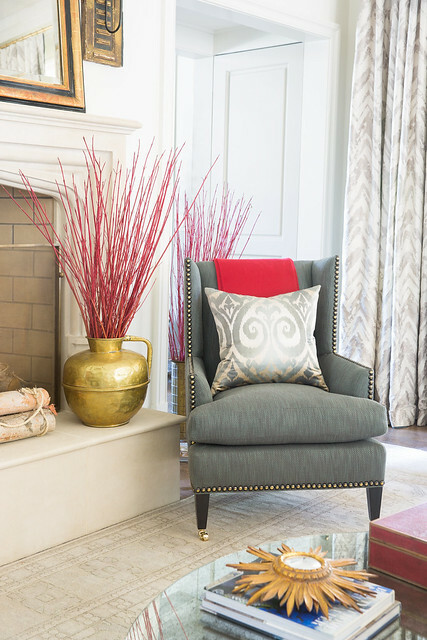 A peek into the living room designed by Susan Ferrier. 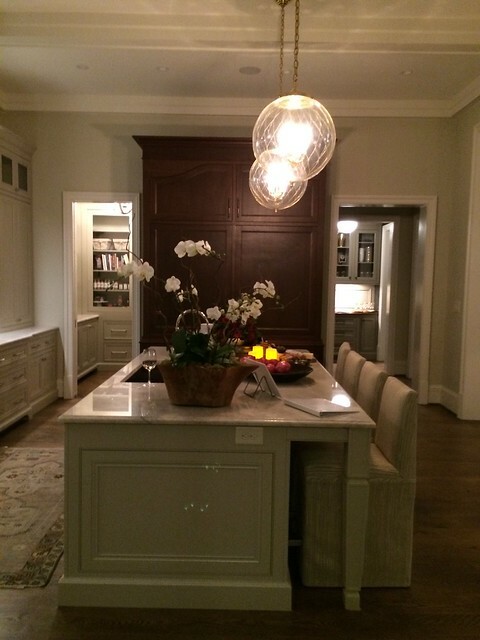 The dining room was designed by Beth Webb, and it looked beautiful at night. Note the intricate design of the ceiling. A close up picture of the ceiling can be seen on my instagram page. Bill Ingram and Danielle Rollins in the study that they decorated. Again, my camera just could not handle the lighting conditions, so I switched to my iphone, which could not take a wider shot – but the room is quite beautiful and this is just one side of it. 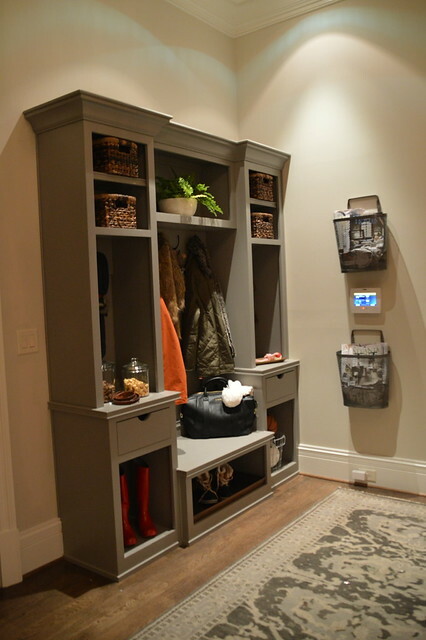 I always like to see the architectural details and design decisions that are made, and I think this is a clever way to incorporate a place for coats and “locker” type items, without making a full structural commitment to the concept. This could be easily removed in future years if there is not a need for it. However, the design is not totally kid centric, which I appreciate too – it can be used for any kind of side entry storage. Design by Flynnsideout. 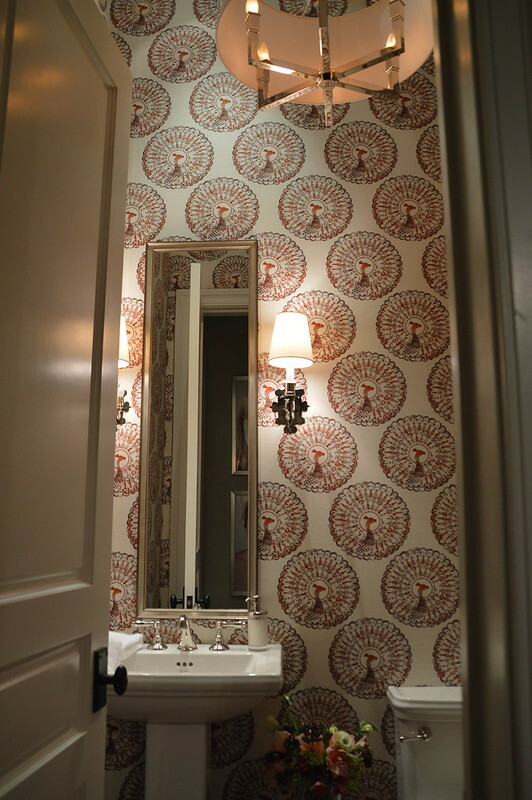 The powder room, one of two on the main floor, was designed by Brian Patrick Flynn. The resources list the fabric lined walls as Tilton Fenwick “Paboreal” in coral, by Duralee. 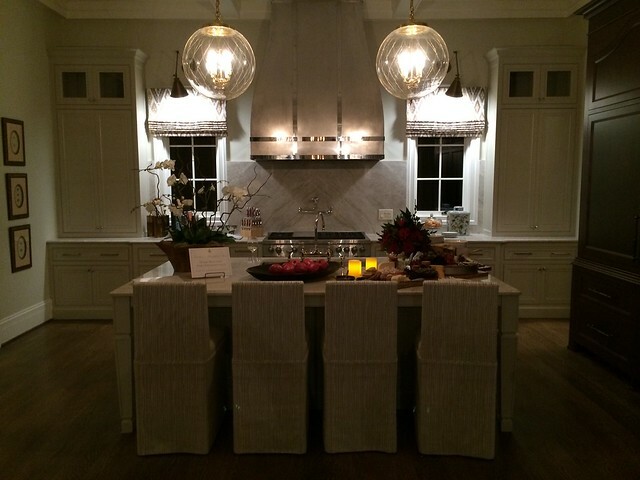 Although this picture is dark, it captures a nice perspective on the architecture and décor of the kitchen, which was designed by Mark Williams and Niki Papadopolous, with cabinetry by Bell Kitchen & Bath Studios. A view of the kitchen from the side. I love the darker finish of the cabinet that houses the the refrigerator and freezer – it looks very much like a piece of furniture. To the left of the fridge is the pantry, and to the right is the bar. 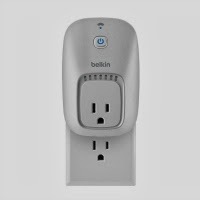 It’s a very well thought out design and I think this will work very well for the future home owners. 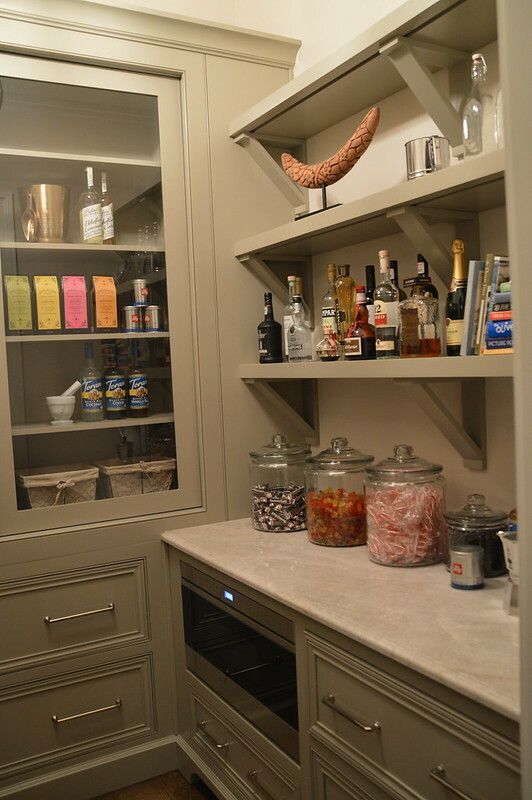 A glimpse inside the pantry – it’s always good for those who are designing a house or renovating to see the architectural ideas from a showhouse. Note how the microwave is in the pantry (I did not notice if there is another one in the kitchen itself), and how there is open shelving, shelving behind doors, as well as drawer storage. As I mentioned, very few of my upstairs pictures turned out, but I thought this picture of a shower from one of the bedrooms was a good example of how it is totally fine to keep the tile very simple in the secondary bedrooms. Note how the wall tile is just a clean, simple white subway tile, and the hexagon tile on the floor is also very simple. Perhaps the warmer color for the floor was selected because it shows less dirt? 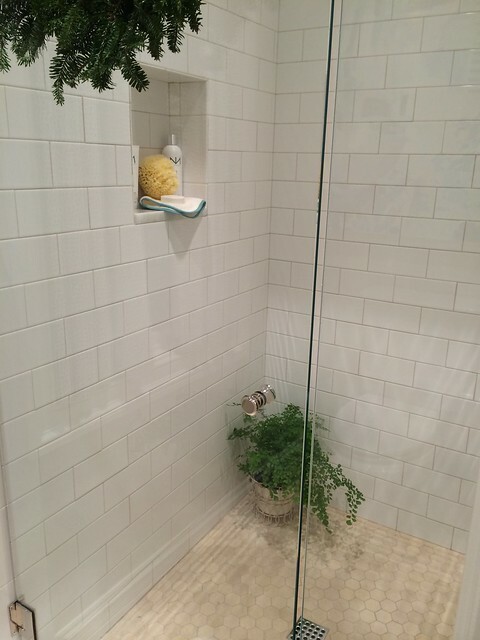 This answers my question – the same tile used in the adjoining sink area is carried through to the shower floor. The bonus room over the garage was all but impossible for an amateur to photograph, but it was one of my favorite rooms in the house. It was designed in such a creative way – it was sophisticated, yet also interesting and comfortable. 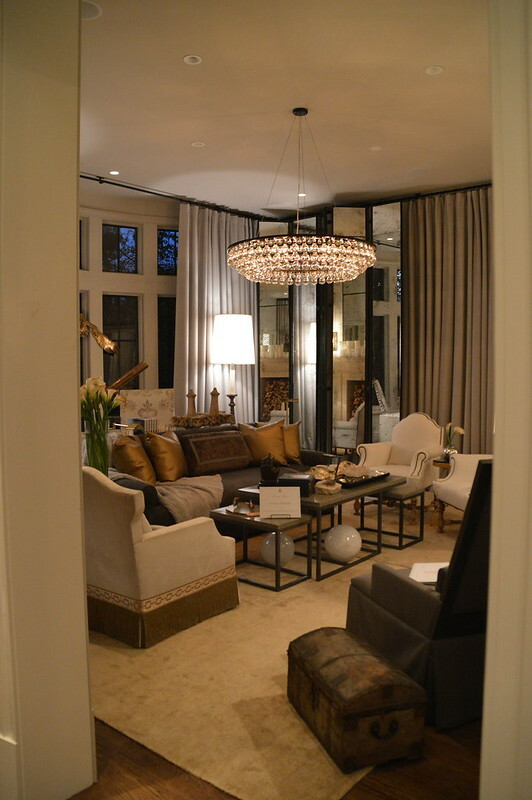 The seating, the art, the lighting, and the accessories were all amazing – it had that hard to describe layered quality that makes a room really successful from a design perspective. 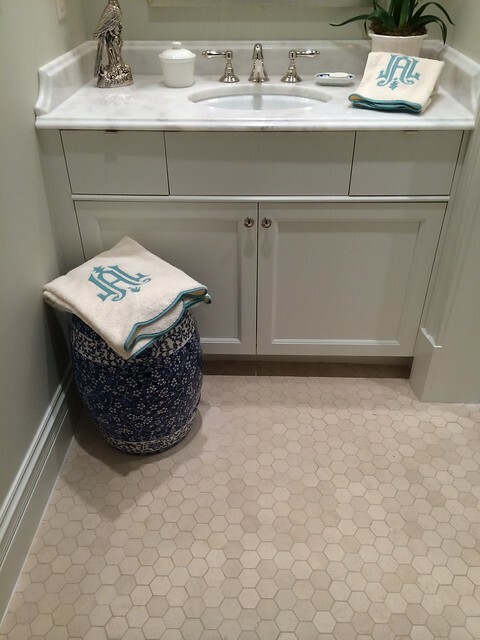 Design by Krista Nye Schwartz and Tami Ramsay of Cloth & Kind. There was no way to photograph the room without a flash, because of the time of day and the lighting conditions, but hopefully this picture gives a sense of what I was describing. The lighting fixture was amazing, and it was the first thing I noticed when I walked up the driveway towards the house – it can be seen through the windows from the front of the house. Here are a few of the professional pictures that were in the marketing kit. 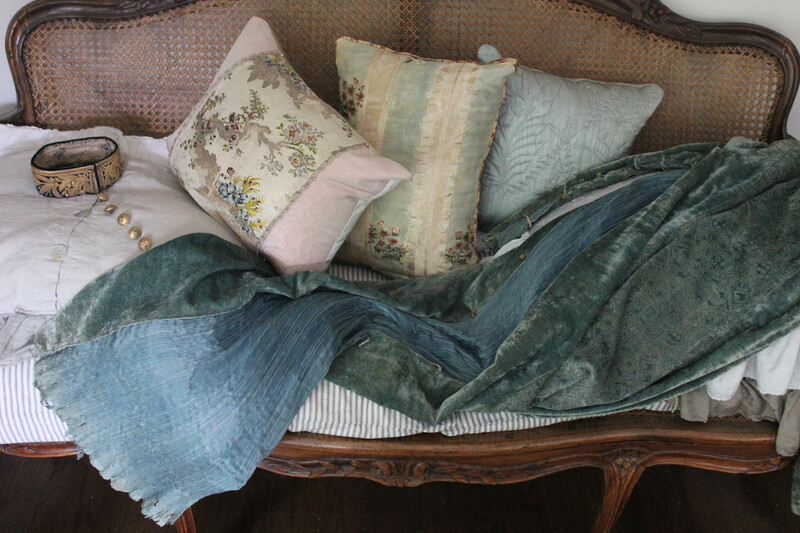 This is a vignette from the sitting room designed by Amy Morris. 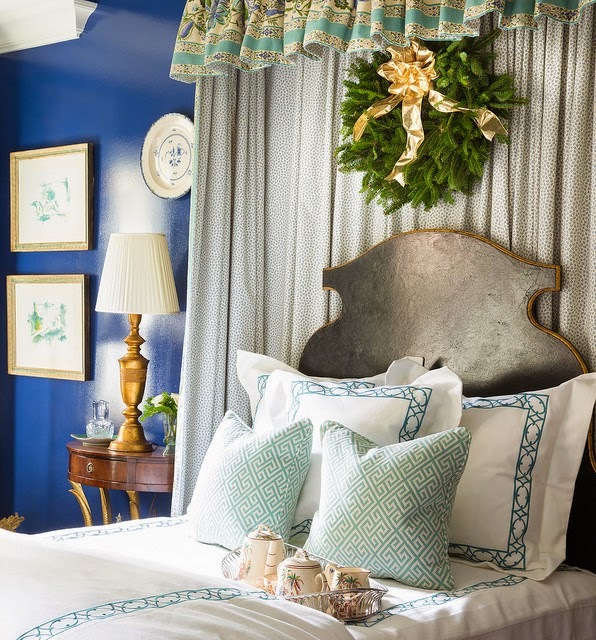 A lovely traditional bedroom designed by Margaret Kirkland Interiors. 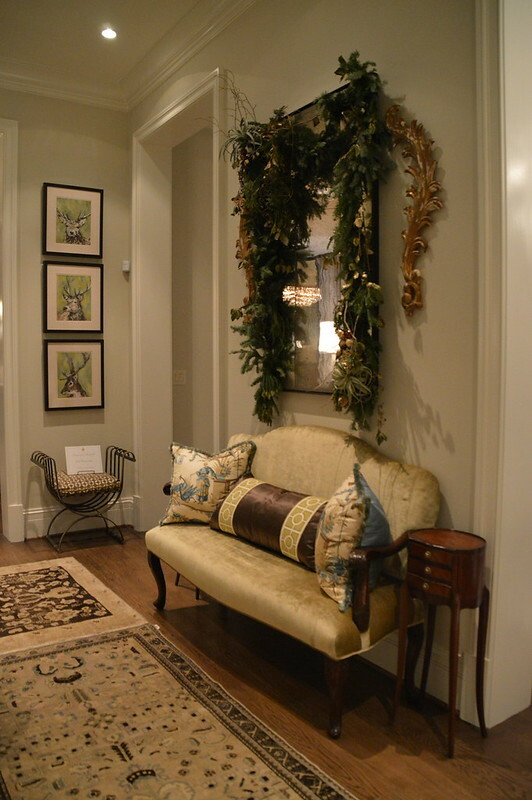 The Atlanta Homes & Lifestyles Home for the Holidays is open now, and I highly recommend a visit! Closed Mondays, Tuesdays and Thanksgiving Day. Parking has been generously donated by ADAC and complimentary Santa’s Shuttles will run continuously from the main entrance of ADAC during showhouse hours. On many days, Santa’s Shuttles will be staffed with volunteer elves, who will be on hand to give guests an overview of the house and ensure that check-in is as smooth as possible. Tickets are $25 and may be purchased online or at the door. Take a trip down memory lane and visit my posts from the 2013 AH&L Home for the Holidays, the 2012 AH&L Christmas house here; the 2009 Christmas House here. So thrilling Holly. Seeing the work of some of my favorite designer, Danielle Rollins, Bill Ingram, etc. Love! This looks like an amazing home! Thanks for sharing your pictures, I am sure it is gorgeous in person! 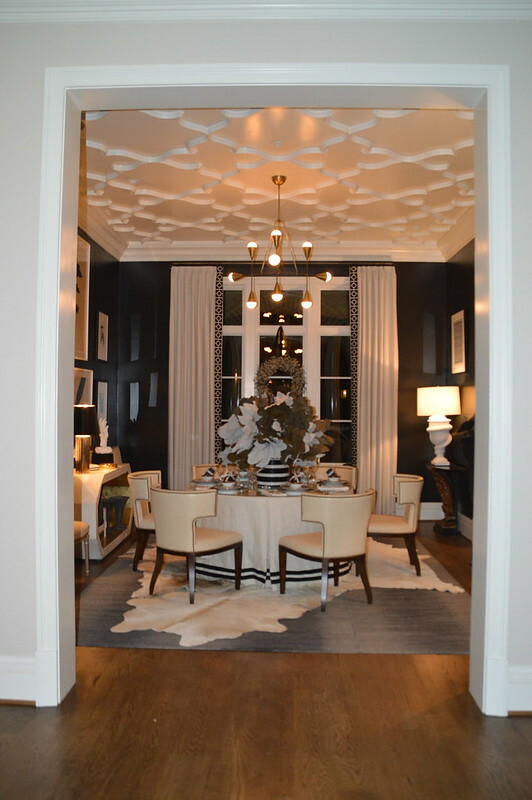 What a wonderful house - love the dining room - so dramatic with the amazing ceiling! Thanks Holly. I drive-by this one once a week, they really got it together in time for the show. I hope to see it and hope to see you out some time. Best wishes. 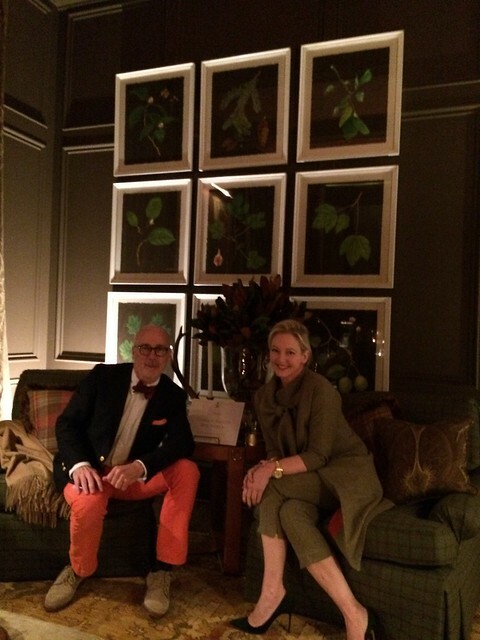 Love Susan Ferrier's living room! The entry hall built in is nice and so useful but looks a little naked, I wish the base was a little higher and the baseboard wrapped around it so it looked more 'built-in' and less like a piece of furniture. Great pantry too (and kitchen). 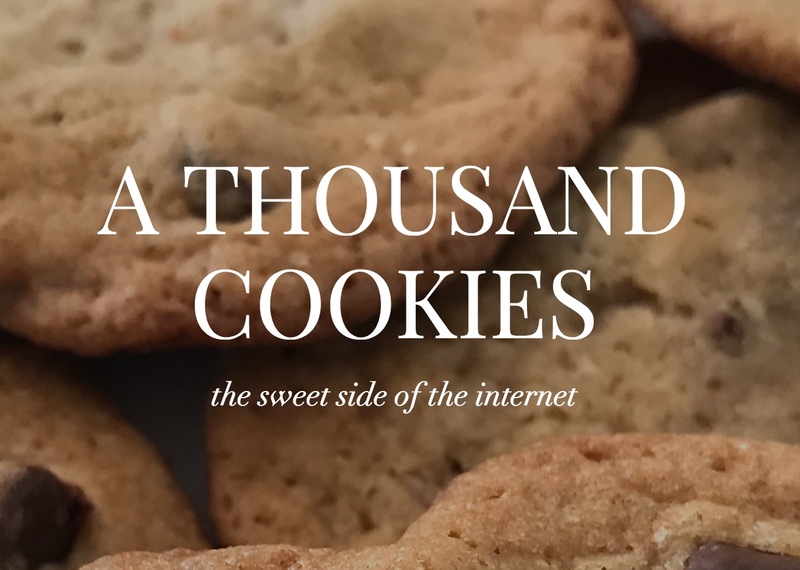 We've been doing more microwaves in pantries and less in the kitchen. Drawers there are a nice touch too -almost like a butler's pantry. Great place for the silver, etc. Bummer i so wish I lived closer, this one looks like a winner! I love how it combines the best of elegance and coziness, every single room is so inviting. I love the bedroom it feels so fresh and pretty. Thank you for sharing! Wow! What a beautiful home. 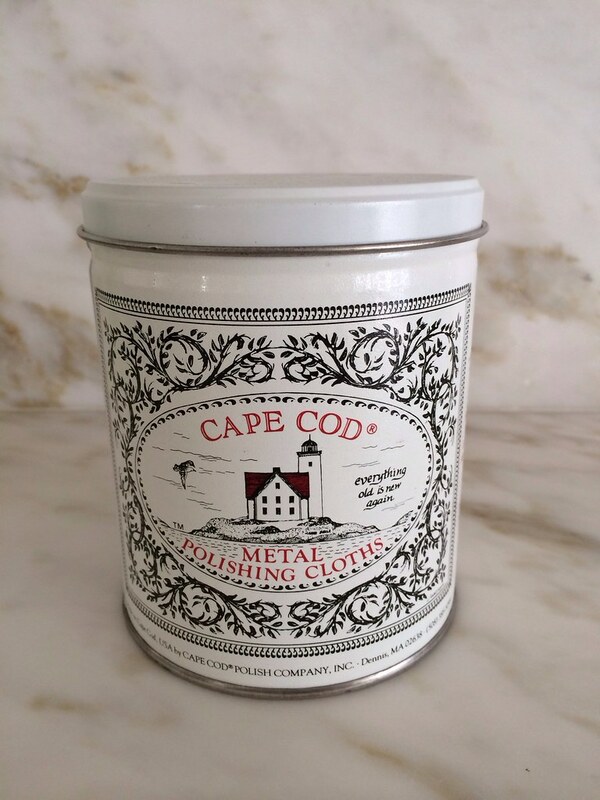 Absolutely adore that powder room wallpaper!